Pink and violet stones surge in value amid uncertainty over site where 90% are found. Over a quarter of a century Larry West has scoured the globe looking for some of the world’s rarest coloured diamonds. This week he secured a big prize, the Argyle Violet, which he bought along with 15 other coloured stones for more than $10m. “At 2.83 carats, this is the largest and most valuable violet diamond ever recovered from the Argyle mine,” says Mr West, founder of New York’s LJ West Diamonds. “You could fill a garbage truck with the rough diamonds produced from the mine every year, an ashtray with pink diamonds but only a half teaspoon of violets,” he says. Rio Tinto’s Argyle mine, which is based in the remote north-west of Australia, produces about 90 per cent of the top-quality red, pink and violet diamonds dug up worldwide. The stones are extraordinarily rare, accounting for 0.1 per cent of the mine’s annual output with the remainder made up of more affordable champagne and cognac stones used in the fashion jewellery sector in the US, China and India. Uncertainty over the Argyle mine’s future, as well as growing appreciation for rare pink diamonds among the super-rich, is prompting a surge in the value of these coloured stones even as the price of traditional white diamonds falls on world markets. A 9.14 carat pink pear-shaped diamond is expected to realise $16m-$18m when it is auctioned at Christies in Geneva next week. “Pink diamond prices have tripled over the past 15 years and on average would be at least 25 to 30 times the value of white diamonds,” says David Fardon, chief executive of Linneys, one of 35 ateliers mandated to buy coloured diamonds from Argyle. By comparison, global sales of diamond jewellery fell in 2015 for the first time in six years, declining 2 per cent to $79bn. Sales of rough diamonds fell 30 per cent. Mr Fardon says the scarcity of coloured pink, red and violet diamonds mined at Argyle has enabled them to buck the downward trend in diamond prices. He says they have become a collectable item, with some of his clients buying the stones to include as part of their retirement savings fund. Prices are rising 15 per cent a year because of increasing awareness of rare coloured diamonds, growing demand from China and India and the fact production at the Argyle mine is only guaranteed until 2020, says Mr Fardon. In 2013 Rio said it was extending Argyle’s life until 2020 by building an underground extension to the existing open-cut mine. But it is uncertain whether Rio will sanction any new investment to extend the Argyle mine’s life beyond that date, in part because the valuable pink diamonds make up a small fraction of the mine’s total output. “The odds are the mine will close a year or two after that, which means these stones will become more and more valuable,” says Mr West, one of the world’s most prodigious buyers’ of Argyle pinks. Rio would not comment on its future investment plans for Argyle. Eden Rachminov, an Israeli diamond specialist and author of The Fancy Colour Diamond Book, says the success of Argyle’s pink diamonds is also down to smart marketing. “Argyle has done a terrific job in branding its stones, which tend to be more expensive than pink diamonds mined elsewhere in the world such as Russia, Africa and Brazil,” he says. Celebrities such as Barbra Streisand, Victoria Beckham, Nicole Kidman and Princess Mary, the Australian who married the Danish crown prince, all own Argyle pinks, which are building a loyal following among the rich and famous. Mr West says he plans to show the Argyle Violet in an exhibition at the Museum of Natural History in Los Angeles to raise awareness of coloured diamonds. “It’s important to let the public see them and get the word out. That can only add value to the market,” he says. The following is a press release from Rio Tinto – 9th November 2018. 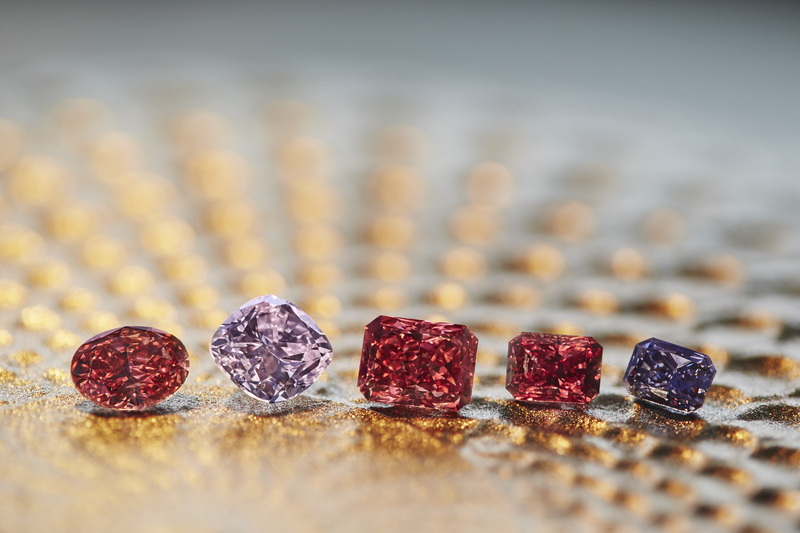 Rio Tinto’s 2018 Argyle Pink Diamonds Tender collection of 63 rare pink, red and violet diamonds from its Argyle mine in Australia has delivered another record result reflecting strong global demand for fancy coloured diamonds. These results are also a reflection of Argyle approaching the end of its mine life, with the supply of these extremely rare diamonds becoming even scarcer. The 2018 collection of the finest pink, red and violet diamonds from the iconic Western Australian mine continued its trajectory of double digit price growth. Sold to an undisclosed buyer, Lot Number 1, the Argyle Muse™, a 2.28 carat Fancy Purplish Red diamond is the most valuable diamond in the Tender’s 34 year history. Amongst the record breaking diamonds sold in the 2018 collection was Lot 2, the Argyle Alpha™, the largest and most valuable Vivid Pink diamond in the history of the Argyle Pink Diamonds Tender. The Argyle Alpha™ was won by Singapore based Argyle Pink Diamonds partner Glajz THG. The Argyle Muse™ is the largest and only Fancy Purplish Red diamond over two carats ever offered at Tender. Image © Rio Tinto 2018. Over the past 18 years the value of Argyle pink diamonds sold at Tender have appreciated over 400 per cent, outperforming all major equity markets. Almost the entire world supply of rare pink, red and violet diamonds come from Rio Tinto’s Argyle diamond mine in the remote east Kimberley region of Western Australia. Current estimates indicate sufficient economic reserves at the mine to support production through to the end of 2020. Rio Tinto’s 2017 annual report released today includes significant changes in estimates of Ore Reserves and Mineral Resources at Rio Tinto’s Argyle Diamond mine in East Kimberley, Western Australia. Rio Tinto has lowered its estimate of diamonds it can viably extract from the Argyle mine, after experiencing operational difficulties and reducing its price forecast. The asset’s ore reserves slumped 45% to 16 million tonnes at the end of 2017 versus a year earlier, the company said in a statement. That translates to 38.5 million recoverable carats, at a grade of 2.4 carats per tonne of ore. Reserves are the economically extractable material present in a mine, and are distinct from resources, which refer to all deposits. The decrease includes almost 5 million tonnes of ore that Rio Tinto depleted during the year at the mine in Australia. It comprises a further 3 million tonnes due to reduced production outlook resulting from operational challenges in 2017, it said. Rio Tinto also cut its price expectation for the mine for 2020 and 2021, resulting in a higher “economic shut-point” — the minimum volume it must produce per quarter for operations to be worthwhile. This, combined with adjustments to its estimates of future mining grades, shaved just over 5 million tonnes off its reserves. The available reserves will enable Argyle operations to continue until 2020. The company could increase the estimate and extend the life span beyond that, depending on how the mine performs, it added. However, the miner said other mineralised deposits at Argyle do not demonstrate economic prospects and are not scheduled for production. As such, Argyle Mineral Resources, exclusive of Ore Reserves, decreased from 15 million tons to zero. Rio Tinto is the industry’s third largest producer by volume, yet only has interests in two producing diamond mines, its 100%-owned Argyle mine in Australia and a 60% stake in the Diavik mine in Canada. By volume, 76% of the company’s net production is estimated to come from Argyle – the largest mine in the world in terms of carat volume produced. The majority of the mine’s production is low quality in terms of size and colour, and the mine’s economics are driven by the occurrence of fancy pink diamonds that fetch a significant premium to white and most other fancy coloured stones. In 2018, Argyle’s production is expected to decrease by 3 million carats year-on-year to 14 million carats. Argyle production commenced in 1983 and, at one point, produced as much as 40 million carats annually, making it arguably the industry’s most important mine. However, as a result of normal depletion, annual production has dropped to 14-17 million carats in recent years. In 2016, Rio took a $241 million impairment charge on Argyle after reassessing mine-life expansion economics and has now cut the mine’s recoverable diamond reserve estimate to 39 million carats, thus reducing the remaining mine life to less than three years. From a May 9th low of just USD $0.7326, the Australian dollar has been on a tear, appreciating by more than 10%, and now trading above USD $0.79, almost its highest level in nearly two years. To be fair, it’s not just the Australian dollar that has appreciated versus the US Dollar over this time period. Since early May, the US Dollar index (which measures the value of the US dollar versus a basket of currencies), has fallen from 99.65 to 93.48, a decline of just over 6%. This weakness in the USD has been caused by a number of factors, including the political uncertainty in Washington, an escalation of tensions on the Korean Peninsula, and finally, a slowdown in key economic variables. Combined, these factors have many wondering how much higher the Federal Reserve will be able raise interest rates in the coming months. The RBA has also contributed to the recent strength of the Australian dollar. In the minutes that accompanied their latest board meeting, they discussed the fact that they thought the long-term neutral cash rate in Australia was 3.5%, which is a full 2% higher than the current rate of interest. This, coupled with a renewed rally in the price of iron ore, which has appreciated by nearly 30% in a matter of months, have been the major drivers of the recent AUD rally. Going forward, whilst the AUD could go up a little more short-term, it’s still likely to fall in the coming months and years, as the iron-ore rally is likely to prove temporary. More importantly, whilst they’d prefer not too, there is still huge scope for the RBA to actually cut interest rates in the coming months and years, something they’ll be forced to do if inflation and wage pressures remain constrained. All up, this recent rally in the AUD should be treated as a gift for Australian investors looking to internationalise a part of their portfolio through investments into foreign currency denominated assets like investment diamonds. The collection comprises five “hero” diamonds selected for their unique beauty and named to ensure there is a permanent record of their contribution to the history of the world’s most important diamonds. A SET of three giant one-kilogram Australian coins have sold for a whopping $1.8 million after commanding the attention of diamond connoisseurs across the globe. The Perth Mint announced the sale of The Australian Trilogy 2017 1 Kilogram coin collection, which describes the pieces as “an incomparable combination of precious metals and rare natural fancy coloured diamonds unearthed from the Argyle Diamond Mine in the east Kimberley Region of Western Australia”. 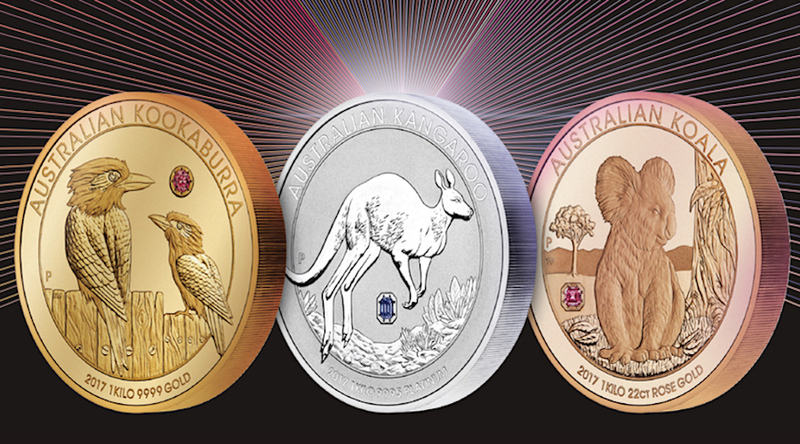 The three coins are gold, platinum and rose gold and portray Australia’s native animals, the kookaburra, kangaroo and koala, each set with the rarest pink and violet diamonds exclusively sourced from the Argyle Diamond Mine within its design. “This coveted collection of diamond studded gold and platinum coins has raised the bar on the concept of ‘unique collectable’, exemplifying the quality craftsmanship for which The Perth Mint and Argyle Pink Diamonds are renowned,” said Perth Mint CEO Richard Hayes. The collection was unveiled last month at the Mint by Western Australia premier Mark McGowan but only just sold to an anonymous Asian collector. “In a convergence of colour and light, this extraordinary collectable embodies the essence of the Australian outback — its unique wildlife, rural landscapes and stunning natural treasures,” the Perth Mint said. The Singapore based company specialises in rare gemstones and luxury jewellery. “The prompt sale of The Australian Trilogy again highlights the premium collectors place on exclusive items, which is what we also found with the sale of the Kimberley Treasure $1 million coin in 2016,” Mr Hayes continued. The collection will remain on display until July 31 at the Perth Mint. A $1.8 million coin trilogy boasting rare violet & pink diamonds has been unveiled at the Perth Mint with international buyers already showing interest in the unique collection. The Australian Trilogy is comprised of three one-kilogram coins struck from gold, platinum and rose gold, with each featuring either a pink, purple-pink or violet diamond, which were unearthed at Rio Tinto’s Argyle mine in the east Kimberley region of Western Australia. Each of the precious metals coins has either a pink, purple-pink or violet diamond, which were unearthed at Rio Tinto’s Argyle mine. One of the coins, made 99.99% of gold, portrays two kookaburras on a wooden fence looking at a 0.47-carat round brilliant cut fancy deep purple-pink diamond. The kangaroo coin, crafted from 99.95% pure platinum, depicts the marsupial in an outback plain with a 0.46-carat emerald-cut fancy dark grey-violet diamond. And the 91.7% rose gold koala coin depicts the animal beneath a eucalyptus tree beside a 0.58-carat emerald-cut fancy intense pink diamond. The Perth Mint will only ever release one of The Australian Trilogy 2017 Collection, said Rio Tinto in a statement. 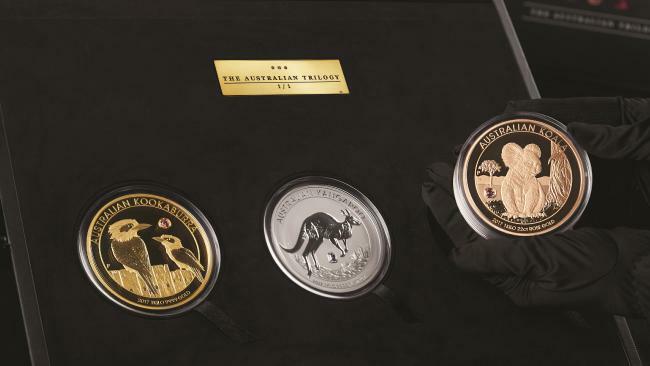 The Trilogy is selling for a cool $1.8 million and will be on display in The Perth Mint Shop throughout June, unless sold prior. The 2016 Kimberley Treasure coin, valued at $1 million, sold to an international buyer within 48 hours. For those in need of a refresher, each year the tender sells the best pinks—and a smattering of reds—produced by the Perth, Australia–based Argyle mine. Through a quirk of nature, the Rio Tinto–owned mine unearths not only smaller stones, but a generous amount of colored diamonds, particularly pinks. (It’s produced reds and blues, as well.) Of course, with colored diamonds, generous is a relative term; these diamonds remain, and will likely always be, extraordinarily rare. In the 30-year history of the Argyle mine, only around 1,650 pinks have ever been sold at the tender, says Josephine Johnson, manager, Argyle pink diamonds. Going to the tender gave me some insights into how these stones are produced and marketed. How are these stones priced? It’s complicated. For many dealers, the best thing about fancy colored diamonds is they are so rare they lack a price list. But that also makes dealing in them challenging. They can be hard to value since there are so few reference points. When Argyle has compared the behavior of pink diamond prices to that of other commodities, it’s found they behave very similarly to fine-art prices (and are not that closely correlated with white diamond prices). “You have seen a very nice appreciation without the volatility you have seen in rest of the diamond market,” Johnson says. Following the 2008 financial crisis, there was a greater interest in pink diamonds as a store of value. But Argyle doesn’t necessarily welcome that kind of talk. Whether the stone is marketable means a lot. If a dealer has a buyer in mind, he will pay more. Argyle also adjusts its estimates based on possible end buyers. If a diamond seems like the kind of a stone a retailer like Harry Winston might sell, that will factor in the estimate (and reserve). The people who have the money, and inclination, to own these diamonds are a select group. “I do know of avid collectors who love them and pursue collections,” says Johnson. “They have suites of all the colors.” New York City is known as a collector’s market. “A lot of the diamonds that end up here never leave their box,” she says. The company has been naming the stones since 2008—for instance, this year’s “hero stones” are dubbed the Cardinal and the Plume. A team now generates lists of ideas for possible names. But this is more than a fun exercise; the names now carry some economic weight. Even with high-res photography and digital imaging, most dealers want to view the gems face-to-diamond-face. To get a better sense of the stone, many dealers try to separate it from the rest of its similarly hued brethren. The diamonds received two grades—one from the GIA, and the other from Argyle, based on the mine’s proprietary colour scale. To most, the GIA scale is most important; in some markets, people look to Argyle. In the end, though, the mine hopes the diamonds do the talking. “We love to see when people get so excited about the diamond and don’t check the cert,” Johnson says. The Argyle tender features some of the rarest and most beautiful gems in the world—not something you see every day. Even veterans dealers always leave impressed. Source: Rob Bates for JCK online. Rob Bates is news director of JCK. He has won numerous editorial awards, including two prestigious Neal Awards for his blog in 2007 and 2011, five Eddies from Folio magazine, and the American Gem Society’s Triple Zero Award for industry service. He has been interviewed by CNN, NPR, The New York Times, The Wall Street Journal, and numerous other places. Global mining company Rio Tinto has announced the launch of a new marketing program for diamonds produced from its Argyle diamond mine in Australia. The program, launched in Beijing, in response to what the company sees as growing consumer and trade interest in diamond provenance, aims to provide Chinese consumers with confidence that each “Australian DiamondTM” they purchase is natural, authentic and originates from the Argyle diamond mine. Rio Tinto further confirms that as of 2016, all of its global marketing activities will be focused on diamonds and jewelry collections that are tracked from the source and have a clear and transparent supply chain. The company says its independently-audited proprietary ‘chain of custody’ system gives authorized suppliers and retailers access to a trademark and a suite of marketing materials including a Certificate of Authenticity to accompany jewelry that passes through the system. A Canadian Diamonds program, covering Rio Tinto Diamond’s share of the production from the Diavik mine in Canada, is expected later this year according to a report by JCK’s Rob Bates.